Many of us have seen the new chef Jamie West manning the exquisite food service at the Ojai Valley Inn & Spa Resort on television and as a culinary associate of the lat e and so great Julia Child, but now he is presiding ove the magnificient Marvilla dining room at the historic Ojai Valley resort. The decor is diva delicious, with warm cranberry colors, and rich French inported fabrics, envelolped by fine art and brilliant gold accents. The artwork, and it surrounds the four room dining venue, is so beautiful it is hard to stay fo cused on the equally artistic plates created by Chef West. Although the menu is huge, I would like to recommend the scallops with mushrooms and veal cheek ragout in white port sauce. This dish leaves you wit h a surf & turf impression. The mushrooms and veal are served in a full bodied port reducgtion that takes on the taste of beef, and the scallops are huge and cooked to perfection. I would also recommend the Kobe short rib entree. The appetizers are many and all superb, as well as the divine desserts. I loved the strawberry creme friachi with honey. The one thing never to overlook at this splendid restaurant is the nearly unending wine list, features has some of the finest wines in the world, as well as favorites from vintners in nearby Calfiornia communities. The sommeiler Jon Mahoney is very happy to assist with pairing selections, and the general manager has some nice suggewstions as well. The service in the Marvilla is perfect. The new decor, exciting menu, perfect pairing of wine, and unchallenged excellence of the culinary skills of Jamie West will make this a star amoung award winning restaurants in California. An evening in this enchanting dining room is an opportuity no one should miss. With this final culinary piece set in the outstandeing mosiac presentation of the Ojai Valley Inn & Spa it is destined to become the finest iresort of its kind n America. For information visit: www.ojairesort.com. Poet Giovanni Pascoli described San Marino as �The azure vision��, and the views of Marecchia Valley and Montefeltro to the Adriatic coastline are spectacular. San Moreno is an independent state that has been preserved for centuries. Sitting high on a hill it is a medieval and magical destination, where visitors are amazed to find a bust of President Abraham Lincoln in the council of Parliament. Lincoln was honored by citizens of this Italian republic for his desire to preserve the integrity of the republic of the United States of America, which guaranteed one nation under God with liberty and justice for all.. The old town center is located on the top of Mount Titano, 750 miles above sea level. The Piazza Della Liberta is the heart of the c ountry�s institutional life. Here you will find the Government Building, where the great and general council of Parliament sits. 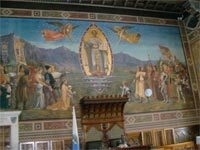 The council room has the latest sound technology, but the benches, art, murals and sculptures are all from grand centuries past. These regal looking chambers have seen the negotiations� of its residents since the 14th century. The entrance to this city within these fortress walls presents crossbow and flag throwing events at the Cava dei Balestrieri during historical pageants on the 1st of April and 1st of October. San Marino offers a full schedule of special events, including music festivals, art exhibits, a Mille Miglia with vintage cars, a world class tennis tournament, a motorcycle grand prix and the September 3rd celebration of the foundation of the republic and Saint Marinus. You wil l also find the Gallery of Modern Art, the Ancient Monastery of Santa Chiara and the Teatro Titano, a charmin theatre built in c. 1750 within this ancient compound. For centuries San Marino economy was based on farming and producing fine food products. The food, olive oil and wine of this region are a tribute to these years of developing agricultural techniques and the grapes for wonderful regional wines. San Moreno Biancale and Roncale are delicious paired with traditional home made pasta dishes, fish, cockerel or rabbit. A restaurant just a few steps from the Parliament offers outstanding food in a dining room with an amazing panoramic view that is unforgettable. The menu offers local antipasto and a variety of wonderful pasta selections, salads, and desserts that are perfect for tourists who prefer a light lunch. A visit to Republica di San Marino remind you of how precious our own republic is and how proud we are that our President Lincoln was so admired by the citizens of this historic Italian republic. For additional information visit: www.italiantourism.com or www.visitsanmarino.com.